This parish ministry is for any and all who are grieving the loss of a loved one, no matter how recent or how long ago. Please consider this invitation for yourself or extend this invitation to another who is suffering loss. All are welcome. Parish grief support gatherings are on the second Saturday of the month beginning with Mass at 8:00 am (the regular Saturday morning Mass). Immediately following Mass, grief support fellowship will take place in the Teachers’ Lounge, concluding at about 9:30 am. See the link above for a schedule of dates. All Saints Pastoral Care Office maintains a listing of local counseling clinics / therapists which have been found to be good resources by others who have sought their services in the areas of individual, marriage/couple and family counseling. They come well recommended as of our most recent information. This would include a balanced and respectful approach to the faith life of clients. For a long time it was the norm in our culture to encourage parents to get over or move on when they experience the loss of a child during or soon after pregnancy. More recently we have come to realize that these losses are no less a cause for grief than other death losses that we experience. Infertility, miscarriage, still birth, abortion and early infant death can bring about the same emotional, physical and psychological symptoms. The need for a path to healing and acceptance is just as real. Precious Hearts Ministry – new at All Saints in the past year – provides prayer, fellowship, resources and support to those who have experienced losses of this kind. Part of Precious Hearts Ministry is a Rosebud table located in the Gathering Space. Each of the six colored roses represent a different circumstance: Infertility or Waiting to Adopt; Pregnancy; Birth or Adoption; Miscarriage or Loss; Grandparent Concerns; and Troubled Times. If you would like prayers or support for any of these circumstances, please visit the table and select the rose and card which best fits your situation. Precious Hearts Ministry hosts occasional support gatherings for those who are experiencing, or have experienced, infertility, pregnancy loss, or infant loss are invited to attend. These gatherings are opportunities to share your story, and to meet others in the parish community with whom you can connect for understanding, fellowship and support. The Advent and Christmas Seasons can be an especially challenging time for persons who have lost a loved one. In early December, Precious Hearts Ministry hosts a Christmas memorial event where participants can decorate Christmas ornaments in memory of children lost in pregnancy or infancy. All family members are welcome (parents, siblings, grandparents, etc.). The Depression Support Coalition has developed a program of monthly informational talks by leading healthcare professionals and clergy educated and experienced about depression and related diseases. The program also offers weekly discussion & support group meetings at some Coalition church locations — designed to provide a network of Christian based support for those affected by depression, as well as their family members. All persons are welcome to attend, regardless of religious affiliation. Detailed information about upcoming speakers and the weekly support groups can be found at the Coalition's website. Growing Through Loss is sponsored by the Interdenominational Coalition of South Suburban Churches (14 “south of the river” churches, including All Saints). This four to five week series takes place twice a year: once in the fall and once in the spring. It is for adults who have experienced a loss or crisis, and / or who wish to learn more about the grief process. Each session is complete in itself and offers a presentation followed by small group support facilitated by trained leaders. You are welcome to attend one or all. There is no cost, but free will offerings are gratefully accepted. Details can be found on the Growing Through Loss homepage. Follow this link to information about support and resources in the local community. If you have suffered from an abortion, you may be experiencing: guilt, shame, anxiety, depression, nightmares, substance abuse, eating disorders, or suicidal thoughts. The pain is real, but you do not have to suffer alone. There are people dedicated to helping you – do not be afraid to reach out for help. Hope After Abortion: www.hopeafterabortion.com/ is the U. S. Catholic Bishops' web site on post-abortion recovery. • A Military Family Support Group for family and friends of military personnel on active duty meets on the second and fourth Monday evenings of each month at Mary, Mother of the Church in Burnsville (952-890-0045). • A Suicide Support Group for those who are surviving the loss of a loved one who died by suicide meets on the second Tuesday of each month at Mary, Mother of the Church in Burnsville (952-890-0045). • Prince of Peace Grief Support at Prince of Peace Lutheran Church in Burnsville is an ongoing support ministry offering information along with emotional and spiritual support. • Rainbows provides support to children who are experiencing grief and loss in their lives. It consists of two 7-week sessions through the fall and winter. St. Elizabeth Ann Seton in Hastings sponsors a Rainbows program. • Partners Around Loss through Support (P.A.L.S.) is a twelve session grief support program for children, youth and their caregivers in families experiencing loss and transition. There is no cost to participate. P.A.L.S. is hosted by Saint John Neumann Catholic Church in Eagan (651-454-2079) at Faithful Shepherd Catholic School and is open to any child regardless of religious affiliation. 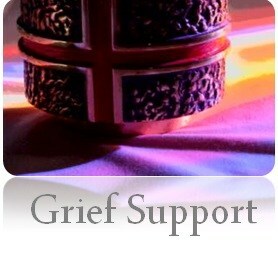 Grief Support Ministry - 2nd Saturday of every month. Mass at 8am followed by a gathering in the Teachers' Lounge. The information on this page is taken from print and online material of the given program or organization. Not all resources will be right for everyone. You need to check it out and determine for yourself if it meets your need. All Saints and its staff do not necessarily endorse any particular resource. We give referral in order to help you find what will serve you. Please let us know if you find that any of this information to be inaccurate so we can update our files. Contact Deacon Jim, griefsupport@allsaintschurch.com / 952.985.9983 for information about any of these resources.